At San Diego Comic-Con 2013 Mattel unveiled a new line of 6"-scale figures to step in and meld the now defunct DC Universe Classics and the weirdly stylized Batman line that had immediately followed it. This new line, called Total Heroes, would provide fully articulated figures built around a somewhat stylized body and shared parts. Each figure would include an accessory and, most importantly, have a Suggested Retail Price of $9.99 - 50% less than the average DCUC figure and half that of 6" Marvel figures. While some bemoaned this as the latest in a long line of villfying decisions by Mattel I was all to happy to accept the constraints of stylized sculpts (I dig the overall aesthetic) and reused parts (folks seem to forget that DCUC was largely based on reuse as well) in exchange for $10 6" figures - something we haven't really seen in a decade! Special Abilities: Breathers underwater at incredible depths, super strong, communicates with and controls undersea creatures. Aaaah, such a deluge of information! Joking aside, though, sometimes cardback bios get a bad rap but I think this is perfect for what the line is. Many of the characters have histories too rich to successfully condense into a paragraph, and attempts to do such often disgress into pro-marketing gobbledygook. Who is this guy and what can he do - that's all we need, kids! 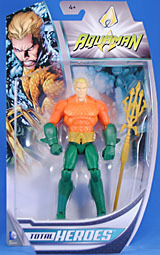 I have a big lust for all things Aquaman so there was absolutely zero question about whether or not I'd get this guy but I was very happy to find him to be the most striking of the four figures in the first series (the others being Batman, Superman and Flash - all in their New 52 outfits). 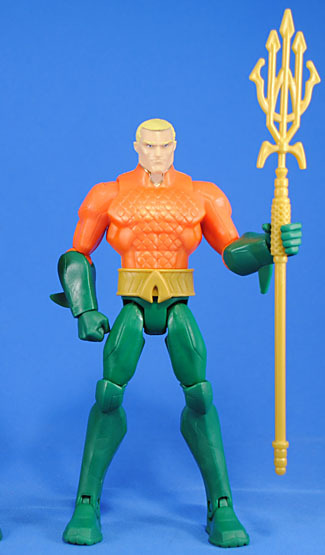 Certainly part of that is simply due to the inherant coolness of Aquaman's complimentary orange & green colorscheme plus the gold belt and trident add a nice bit of flair too. It also helps that his colors "pop" against the mostly gray background of the card (which comically and ironically looks a lot like the first batch of Hasbro Marvel Legends cards), but indeed it's the orange plastic of his shirt that really grabs the eye. Paint is fairly basic on the figures, with a lot of reliance on molded plastic and broad colors to match that which ends up working well for the style of the line (not to mention keeps those costs down to an affordable price). While the forearms, hands, waist, legs and feet are cast in flat green plastic the shirt uses a semi-​pearlescent orange unlike any other kind of plastic I can recall seeing. It's less shimmery than metallic coloring and more even/consistent than traditional pearlescent shades but it's that subtlety that really makes it pop out and grab the eye. 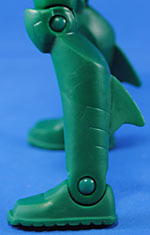 I'd love to see a future variant use the same technique for the green plastic (and possibly the gold as well) to get a super shimmery man of aqua! Beyond that, the paint is pretty tight and clean, and is focused almost entirely on and around the head. Sculpturally I quite like the figure as well. I've never been especially opposed to stylized figures though going that route certainly can risk hitting an extreme that turns off most people. Fortunately I think this line hits a "happy medium" between the more conventional look of DCUC and the more exaggerated look of things like figures based on a specific artist's work. What is a bit of a gamble is going with base/generic body that has a lot of sculpted details on it, for instance the Superman-"S Shield"-like shapes on the shoulders and lining on the thighs, but I guess that's fairly accurate to all of the New 52 redesigns. It is, though, hard to really gauge the impact of such re-used parts with this figure since he appears to have so many unique peices. His forearms and shin/calves are unique, giving him the trademark fins plus some interesting gill-ish patterns on his calves. The belt, head, and upper torso are also, obviously, unique and all done pretty well; again hitting that stylistic sweet spot. It is a little odd at first that his signature shirt scales don't cover the whole shirt but considering the "re-use" needs of the line it makes sense. It plays into the overall aesthetic well and the awesome, shiny plastic ties the shirt together pretty well on its own. 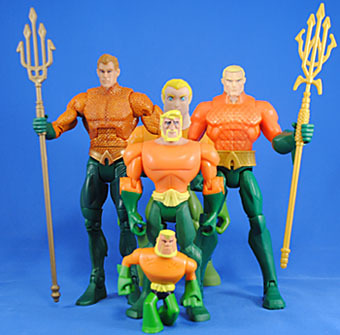 These figures get 14 points of articulation and Aquaman is no different. He has balljoints at shoulders and elbows, sort of a balljoint version of T-croth at the hips, an expectedly restricted-of-motion balljointed head, hinged knees and ankles with swivel cuts at the wrists and wasit. All in all you can him to do the major poses pretty much. The hips are super-hinged so that he can do some pretty extreme splits and there's nothing on the elbows preventing backwards swing for some novel broken-arm poses. Sure, there are some points that could be improved but it really comes back to the $10 pricepoint. He already moves better than a lot of other toys on the market, and has better coloring (through paint and plastic). As long as the price stays at $10 I can't really see much to complain about. He even comes with his trusty trident, which looks great, though the thicked-up handle (to fit his wide grip) is a little odd just in that it points out how oddly wide that grip is. I've been into this line ever since it was announced and the only real question was "can they truly deliver these at an SRP of $9.99?" 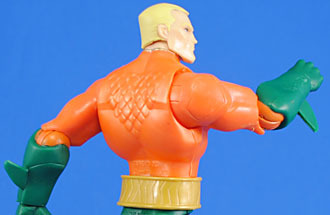 While some retailers have predictably bumped that up (oh, hi there Toys Я Us) most have the figures at that price and the figures, or Aquaman at least, are well worth it! I highly recommend this figure. Not only is he just plain cool (Aq 4 Lyfe!!!) he certainly looks to be an excellent "jumping on point" to test the, ahem, waters and see if this new line works for you. And I really hope it does - I want it to do well for Mattel so we can get many of the awesome other figures they've revealed!